Built by a beauty-loving Queen during the height of the European Renaissance, the Jardin du Luxembourg (Luxembourg Gardens) still retains a decidedly royal and grandiose feel and is one of the loveliest places in Paris to visit. Locals and tourists alike stream in during the spring and summer months, but the gardens can be picturesque at any time of year. Situated on the border between Saint-Germain-des-Prés and the Latin Quarter, the Luxembourg Gardens, inspired by the Boboli Gardens at Pitti Palace in Florence, were created under the direction of Queen Marie de Medici in 1612. The beautiful Luxembourg Palace, now a government building, was originally owned by the Duke of Luxembourg, thus the name. There’s something to do for every member of the family at this popular destination. While some are happy just to sit on a bench and read or look out over the vast gardens, there are many activities available. Wander the gardens: The lushly landscaped gardens, which cover 25 hectares (approximately 62 acres) of land, balance a formal French-style garden on one side, full of geometric beauty, with a somewhat wild-looking English-style garden on the other. The enormous central terrace and pond are bordered by flowers, shrubbery, and statuary. Also on the grounds are an apple orchard, long lanes of deciduous trees (particularly beautiful in fall), an apiary where you can learn about bee-keeping, greenhouses with a stunning collection of orchids, and a rose garden. The Orangerie, a former greenhouse, is now used for exhibits of photos and artwork. See the statues: Throughout the gardens, you will find over 100 statues dating from the 19th century to the present. These include figures of notable European women and French queens and, interestingly, a miniature replica of the Statue of Liberty. The sculpture, "Fountain of the Observatory" (in the area known as the Jardin Marco Polo), is an impressive work in bronze. It represents a collaborative effort between four French sculptors. Fun for kids: Children will love the puppet theatre with shows in the warmer months. There are toy sailboat and remote-control boat rentals at the pond and a playground area with an old-fashioned carousel. They can take a pony ride or enjoy a treat at one of the concession stands. There is also a flock of parakeets that call the gardens home. Look for them in the trees. Play, tour, and picnic: Adults can play chess, tennis, and bridge or try their hand at the remote control boats. Guided tours led by one of the park’s gardeners are generally available on the first Wednesday of the month from April to October. Tours meet in front of the Observatoire (observatory) gate at 9:30 a.m. If you're visiting during the warmer months and would like to relax at the gardens with crusty baguettes, cheese, fruit, and perhaps a little rosé, there's a large lawn on the garden's south side that would be perfect. The surrounding neighborhoods provide interesting streets to walk, cafes to stop for coffee, and attractions like museums. Latin Quarter: Luxembourg Gardens is situated in a corner of this old Parisian center of scholarship, arts, and learning. 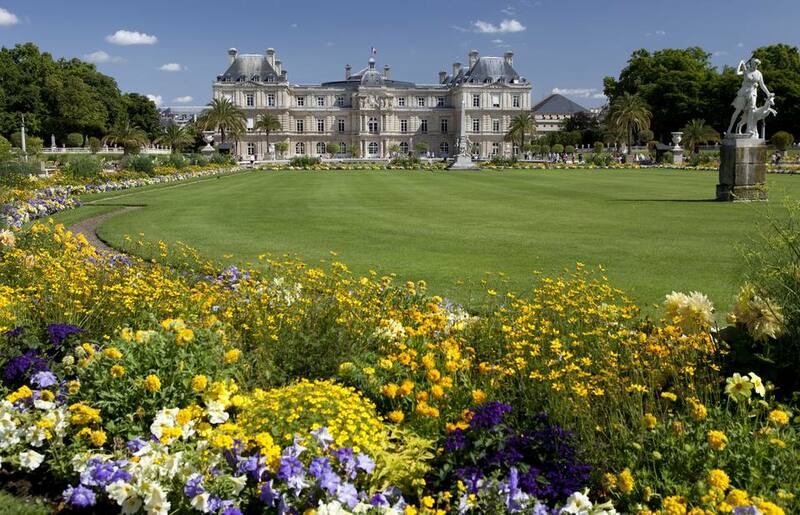 Be sure and notice the Luxembourg Palace (now a government building) in your tour of the neighborhood. Just blocks away, the lovely old Sorbonne University sits on the Place de la Sorbonne, lined with cafes. Across the street and up a short hill, looms the Pantheon, a grandiose mausoleum that holds the remains of some of France's greatest minds, from Alexandre Dumas to Marie Curie. St-Germain-des-Prés: The southern and western edges of the gardens are located in this iconic neighborhood where writers and artists including Simone de Beauvoir and Jean-Paul Sartre haunted local cafes. Musee Cluny/Medieval Museum: Housed in a magnificent medieval residence whose foundations lay on the ruins of Roman thermal baths, the National Medieval Museum boasts the city's most important collection of art and artifacts from the Middle Ages. Luxembourg Museum (Musee du Luxembourg): The Luxembourg Museum is located on the park's northwest end via a separate entrance. The museum hosts two major exhibits per year, which almost always sell out (booking tickets well in advance is highly advisable). The gardens stretch between the Latin Quarter and the St-Germain-des Prés neighborhood, in Paris' 6th arrondissement (district). The gardens are open year-round (a few holiday closures), with hours varying depending on the season (essentially, dawn to dusk). Entry is free for all. To access the gardens, there are several main entrances: Place Edmond Rostand, Place André Honnorat, Rue Guynemer, or Rue de Vaugirard. All entrances to the Luxembourg Gardens and many of the paths are wheelchair-accessible. There are several handicap accessible toilets in the gardens. Service dogs are allowed. Pet dogs are allowed too but must be kept on a leash and taken on the paths designated for dogs.